I had very high hopes for the newly released Canada's Food Guide. I thought that maybe this time around, Canada's government would let go of the wishes of food lobbyists and look deeply at the true nutritional needs of Canadians. Canadians have waited 12 long years for an update and, while many experts will say that this new update is "good", in my opinion, one big shift would have made all the difference. Canada's Food Guide | what works & what's still missing! Let’s celebrate what the new guidelines got right for Canadians! Changing “Meat and Alternatives” to simply “Protein” as a new umbrella category. I loved seeing the suggestion to, “Eat more plants, and less meat and dairy”. The guide continues with, “The regular intake of plant-based foods – vegetables, fruit... and plant-based proteins – can have positive effects on health.” There are many studies showing that eating plant based lowers the risk of Cancer, Heart Disease, Stroke and diabetes. Bravo! This nutrition guide focusses on filling half of your plate with a selection of produce... and eating it! This practise is great for your liver and brain because you'll get lots of folate (Vitamin B9), and it's also great for boosting your fibre intake, thus reducing the rates of bowel disease and heart disease. I wish they listed produce with a focus on fresh produce first, frozen when needed and preserves in glass jars over canned goods (raising awareness of the concern of tinned food). This new focus on produce is long overdue and I hope that Canadians finally prioritize getting their 10 servings a day! I do wish that the guide had mentioned that your focus should be on low-sugar choices. If 10 servings of fruit are ingested per day, it could still strain your liver because of the need to convert fructose to glucose, and potentially contributing to fatty liver syndrome. The good news is that most of the high sugar concern is caused by high fructose corn syrup, which is now mostly avoided with the recommendation to drink water. Drinking water as your 'beverage of choice' is a wonderful part of Canada's Dietary Guidelines overhaul but it should go further. Increasing water consumption will promote true hydration and, I am optimistically hopeful, will reduce the consumption of pop and alcohol. The guide shared, “in 2015, sugary drinks were the main sources of total sugars in the diets of Canadians.” Simply substituting water for your liquid calories from iced coffee, pop, milk and iced tea, you could shave-off 400 calories a day! In the past, the guide considered fruit juice a healthy option, though it's now understood that removing the fibre from fruit through the act of juice extraction concentrates the sugars in a way that may be of concern to when watching waistlines and insulin levels. Saying that, I think they could have put green juices on the encouraged list as it is low in sugar and very healthy. Milk has finally been cut-out as its own food group! Milk is not a food group; it's a source of protein and minerals. So is seed 'milk'! As 65% of adults cannot digest dairy, it was time they let go of this recommendation. Menopausal women concerned about bone strength, should instead focus on plant sources of calcium – like creamy tahini, a sesame seed butter that has 4 times the amount of calcium of dairy! What could improve the 2019 version of Canada's Dietary Guidelines? Teach Canadians about The 3 Macronutrients. 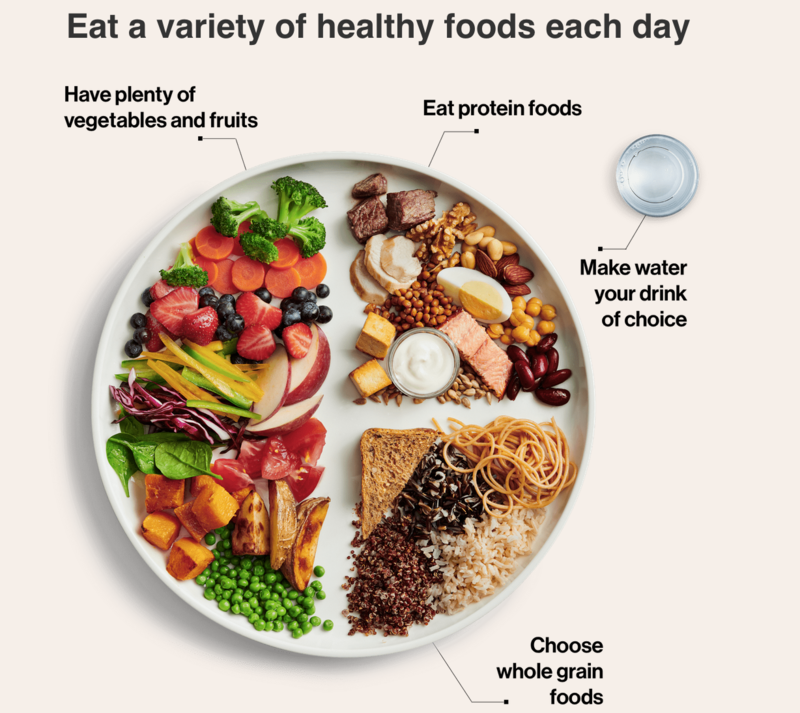 The 3 true food groups are Carbohydrates, Fats and Protein, and even though it is a simple concept, the Canada's Dietary Guidelines focus on examples of a type of food (i.e. grains) instead of sharing that those carbohydrate needs can be fulfilled with fruit and veggies alone. Why is "protein" defined, while "fats" and "carbohydrates" are not given the same? A problem with the old guidelines was that Canadians were tempted by the maximum recommended servings. For example, at a glance, a number of my clients felt they could eat up to 10 servings of grains a day! At that amount, the average Canadian would struggle with their weight. The amount of grains on the menu may cause weight to balloon because it spikes insulin, driving fat storage. It's also worthwhile to mention that industrialized growing of grain is a strain for the Earth, due to mono-crop farming and increased use of pesticides. There are so many plants that can be farmed or foraged naturally and have less impact on your body and the planet. For example, lamb quarters, which grow near corn fields, could be eaten instead of sprayed it with glyphosate and other chemicals, increasing the biodiversity of plant and animal species. Plus, we'd get to eat something that tastes essentially like delicious spinach! Instead of "Grains" as a catchall title for carbohydrates, I think it would be more beneficial to explain sources of carbohydrates, explain slow carbs vs. fast carbs and give solid examples; i.e. squash, yams, plantains, dates, onions, carrots, beets and jicama, to name only a few! Where are the good fats? Enjoying more healthy oils, like olive and avocado, can reduce obesity and heart disease. Locally produced hemp oil deserves a mention as well. With the overwhelming popularity of the 'fat-fuelled menu' for weight balance, brain health and improved immunity, it's shame that Canadians may have to wait another 10 years for our government to catch up with this movement! Saturated fat does not cause heart disease. The real nutritional culprits to heart disease include sugar, flour, denatured and processed foods that creates inflammation in the arteries. Here is a good article that explains this issue in further detail. It is also time to let go of the need to slash unrefined salt. Real salt (i.e. grey, pink etc) contains plenty of magnesium and other important minerals, which is why it generally won't affect blood pressure in a negative way. 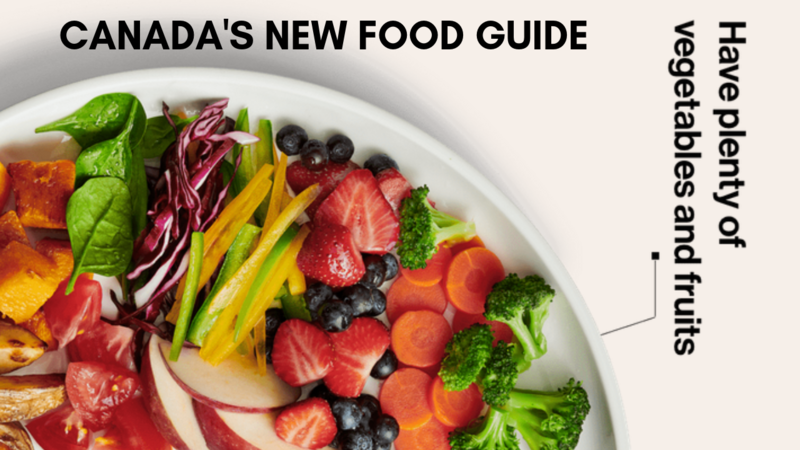 In summary, the best part of Canada's Food Guide 2019 is that it points to “how” to eat vs. “what” to eat! This is sound advice on how to become conscious of your food habits. If Canadians embrace this advice, there is real hope for the health of the Nation! Ever asked how the food guide evolved in the first place? 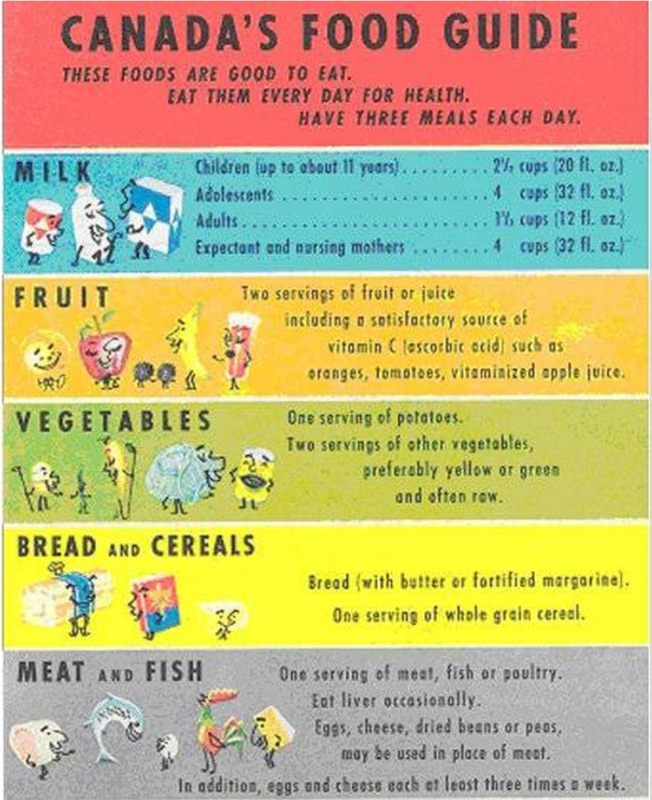 I've been having fun looking back to see how Nutrition Science has evolved. Come along and have a look at the quantum leap made since Canada's first Food Guide. 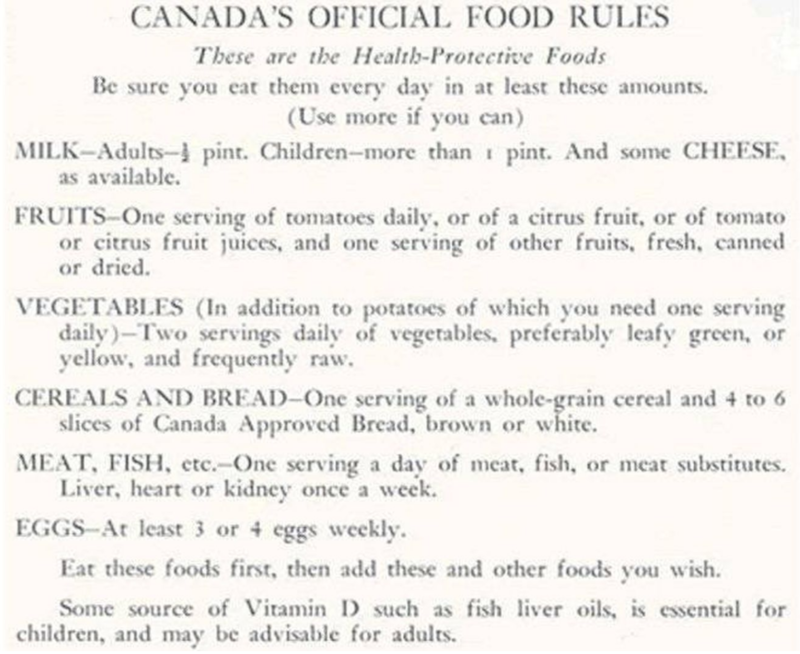 Canada's Official Food Rules (photo above) were created due to wartime rationing. While healthy store-bought food was scarce, it's too bad that Canadians weren't instructed to continue gardening and foraging for healthy and nutritious food. There were 6 food groups, which I find interesting, with a focus on Vitamin D foods and at least one serving of liver, heart or kidney weekly! Only 2 years later, the references to kidney and heart were removed, due to limited supply. 1 in 3 woman in the world suffer from anemia (iron deficiency) and I wonder if that would be the case now if the government still advocated for eating organic organ meats? Interesting to note that there was the advice to drink plenty of water. Meat “substitutes” changed to “alternates,” with references to beans, peas and nuts. It is too bad the most interesting suggestion, to include, "some source of Vitamin D such as fish liver oil" (which is terrific for immunity and brain development) disappeared! I think should have stayed in the CFG for the last 70 years) Do you agree? Canada's government softened it grip by dropped the word “rules” and started to use “guide” to show the "flexibility and the variety of foods that could satisfy nutritional needs". I love the happy visuals but sadly, it had a growing focus on dairy and grains. 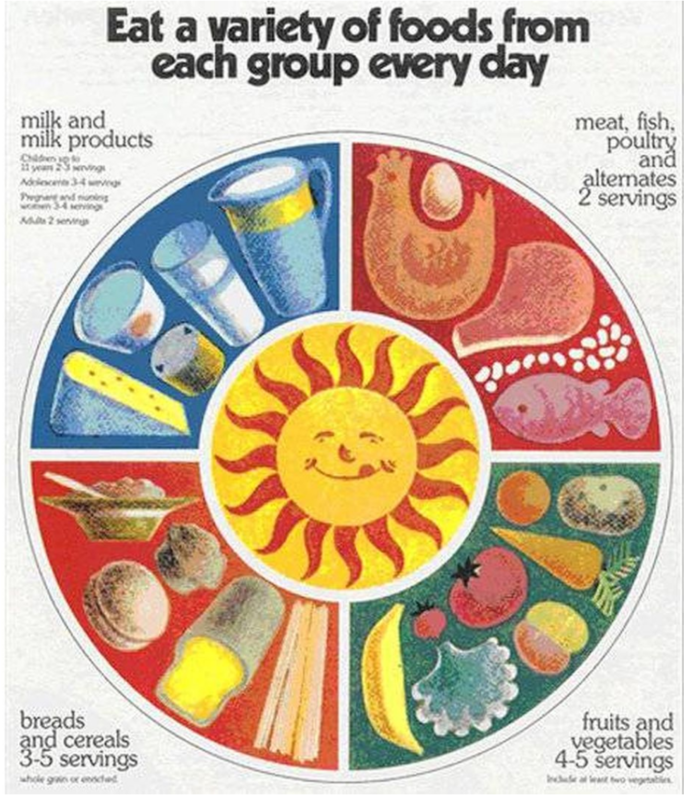 The 70s continued with the same high-carbohydrate recommendations. Fruits and vegetables were consolidated into one group, a mistake (in my opinion) as they offer very different nutrients. Milk was expanded to include dairy products, and the recommended amounts were 'off-the-charts'. Dairy is a source of fat and protein, yet only 35% of people can digest dairy after infancy! If you can’t digest it, then you can’t utilize it, so why make it such a central part of a food guide? The Dairy Board of Canada is a powerful lobby group and may have developed a deep influence on Canada's Food Guide. Each of the four food groups was outfitted with a servings number range, which started a lot of confusion. Many Canadians assumed they could eat at the top end of the servings range and this is about the time obesity rates started the climb. Though, you just gotta love that sunny graphic, right? Talk about 'losing the plot'! 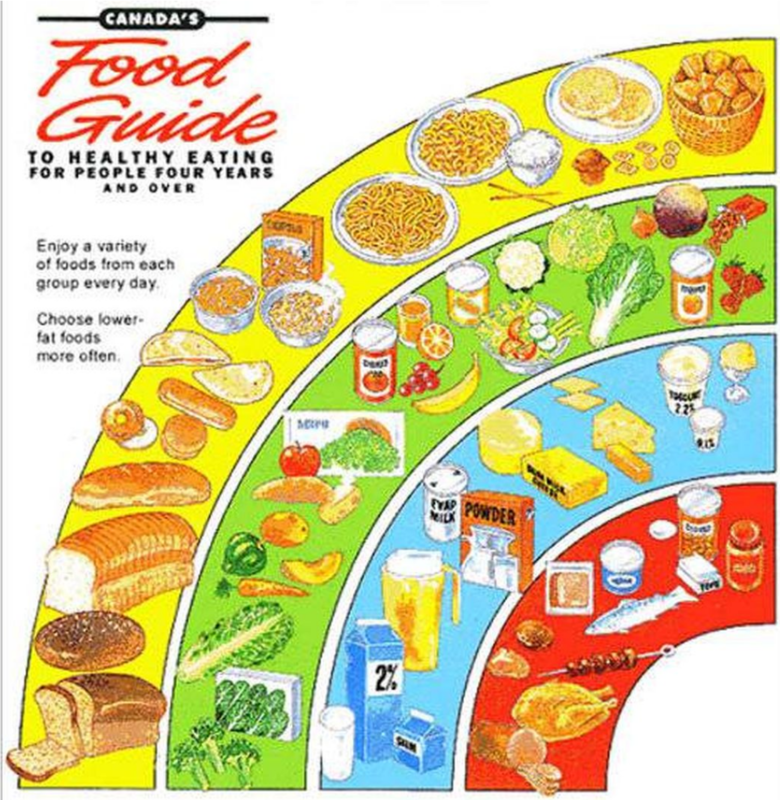 The 1992 Canada's Food Guide used a graphic representation of a rainbow-style format to indicate visually which food groups should be eaten in greater quantities, making grains the largest arc. This grain suggestion further confused Canadians and many people cut out fat and embraced eating up to 10 slices of bread or piles of pasta every day. 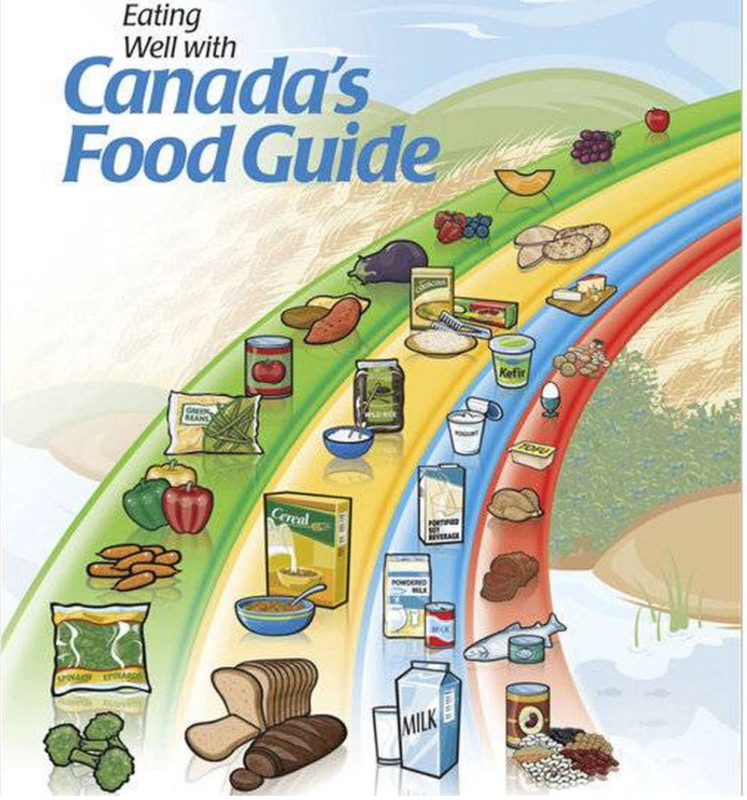 2007 expanded Canada's Food Guide to a big six-page document with serving recommendations based on age and gender. This was a good move in my opinion as servings are important to cover in such a detailed document. People need to understand what a serving is and let their activity levels be a guide as to how many servings they get to enjoy. Essentially, you must earn your carbs! An elite athlete needs the higher end of the range, and a person who does not work out at all needs to be very careful of insulin spiking carbohydrates as insulin is a fat storage hormone. The best move of this guide? Fruits and vegetables finally occupied the largest arc in the rainbow, bumping grains to second. A small step forward but still too much insulin spiking carbs to really make a difference. So what would I like to see as an updated visual guideline for healthy eaters? 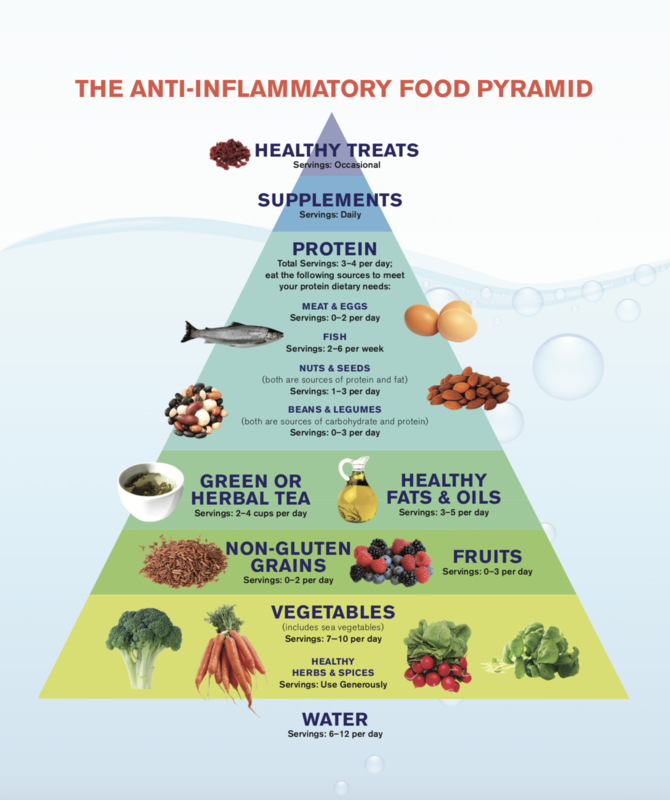 More along the lines of my anti-inflammatory food pyramid that I created in 2010 for my book Meals That Heal.